So, we have finally completed a year in our job and also in Bangalore. 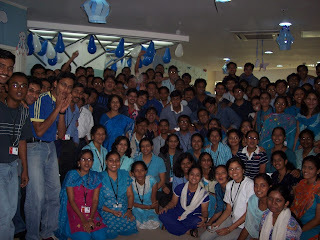 From young graduates right out of college to software professionals, its been an amazing transformation. A transformation which includes an experience like never before. I still remember the day I was coming to Bangalore. Right after my final semester exams and after just a week's break, I had set out on the flight from Kolkata to Bangalore. It was my first experience of a flight and was full of emotions. My mom had tears in her eyes as she bade me goodbye at the airport and my grandmom could hardly speak. I was about to set foot out of my safe zone and face the world to make my mark, to become a man. So when the flight touched down at Bangalore's HAL Airport, the first thing that caught my notice was the weather. It was cold; really cold. From the hot and humid high 30 degrees in Kolkata to a low cold 20 degrees in Bangalore on June 30th, the weather change was dramatic. This actually lasted the entire time from July - September and we got used to wearing jackets which we could never imagine in Jamshedpur or Kolkata during this time. Apart from the weather, what also I noticed was the language and the culture change. But Bangalore is a very open-minded city and you can easily manage here without knowing the local language, a very unlike Chennai. But yes, the culture change was evident everywhere. From a very laid-back approach in Kolkata, you are into a highly professional culture of Bangalore. Every morning when you board the bus to office, you can see a huge crowd of people wearing tags and waiting for their buses to take them to their workplace. Now talking about workplace, the experience at MindTree has been phenomenal. First 3 months of C2 training - the Orchard experience, House activities, PALs, inter-house competitions, Ethnic Day to sessions, lectures, assessments and finally allotment into projects; it ensured our transformation from college to corporate was smooth and actually enjoyable. It was also during the C2 training that we had our OBL trip to Savandurga. 120 Campus Minds on a one-day trip. Savandurga is famous as the largest single rock structure in Asia. From garbage collection drive to walking on ropes, from getting thrown off a rock in Trust the team to playing dodge ball in the mud; it was amazing fun. But the enjoyment in Bangalore didn't remain confined to team outings only. In August, Payal Di had come down to Bangalore from Cambridge for Rakhi. And the 3 days she was here, we had awesome fun. I had my first experience of late night movies at a multiplex when we watched 'Heyy Babyy' 10:30 pm show on the day of Rakhi. Now it took me 2 months since coming to Bangalore to make my first trip out of Bangalore. 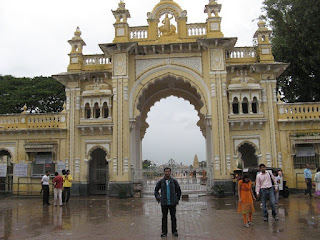 On 15th Sep morning, I boarded the Volvo bus to Mysore for which was to become the weekend trip I would never forget. From visiting the Infy campus (which was simply breath-taking) to Brindavan Gardens, I had an awesome time with my friends. We managed to offer puja at Chamundeshwari Temple, lunch at Rice Bowl and even make a trip to City Palace in the rain. A whirlwind weekend and a truly cherishable experience; an experience which I was to revisit two weekends later with my MindTree mates. 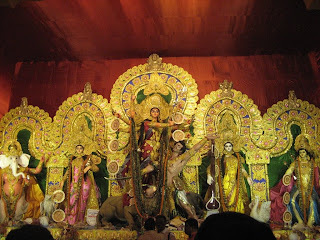 Then came the Pujas and my first trip back home. It was so uncertain that we had to go by train from Chennai. The trip by bus to Chennai was pathetic and the weather was worse. But our eagerness to reach home made me forget all those hardships faced. Pujas were great and I had a beautiful time home. It also made me realize how important it was to spend time with your family and relatives. We came back refreshed after the trip and ready to face the next months which went off in a fly. The Avis Redesign project, the host of sessions & lectures we attended as part of the ramp up sessions and whole new team feeling. It was amazing. What really went in my favour was that I had about 15 Campus Minds from my batch joining along with me. I had a group at the very start. The project time has been a total learning experience. Apart from learning a whole set of new technologies, I also learnt how to actually work in a team. How to coordinate, cooperate and share knowledge so as to benefit everyone. And being part of a huge group had other benefits too. Frequent outings, team outings and even over-night trip to Value Lanes in January. It has been a rocking time being part of ABG and Avis Redesign. Bangalore also got me in touch with another thing I truly liked - Blogging. And it was being part of Blogger's Community that took me to these camps being held in Bangalore - DevCamp and BarCamp. A truly enriching experience, I got to know a whole new side of the city. I met up with a lot of people who shared similar interests and really enjoyed the concept of knowledge sharing and open-source community. In between all this I managed my second trip back home. This time, it was for my convocation. On 16th february, when I received my Bachelor of Engineering degree, I finally graduated from college. I was an Engineer. That day was truly enjoyable. Lunch at Rich (I realized how much I missed it; especially Chamki's food) and then party in the evening at Park Street with friends. Then I went for a trip to North Bengal with my parents. A week at home and I was back to Bangalore. 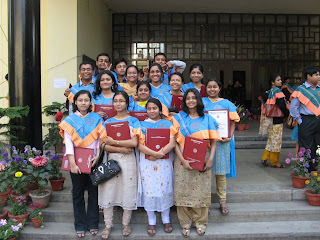 It was only in March that we managed to form our Loyola group in Bangalore. It took some special effort from some of us but we were back together. 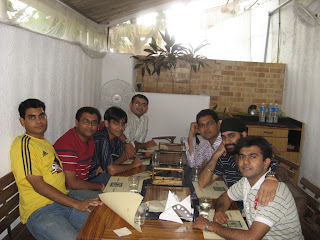 Then a host of parties at various hangouts in Bangalore. Suddenly, life was no more only work. It was enjoyable. From watching IPL matches at Mojos to listening live music at Java City, from bearing Sayantan's jokes to celebrating birthday at Barbeque Nation; its been masti all the time. Now a year has passed and I have supposedly grown one year wiser. Can't confirm that but have certainly confirm is that I have definitely become a lot more independent and a lot more informed. Hopefully it will stand me in good stead for a lot more years in the future. It all started when Sajan, ABG's Delivery Manager, told us that Avis Budget Group, on the occasion of completing of 8 years of the account, had asked us to have a celebration. There were many suggestions pouring in on how to spend the funds allocated. They ranged from social service initiative to trekking in Kerela etc. But finally, the one which was chosen was the entire team going to watch an IPL match. The match chosen was Bangalore Royal Challengers vs. Delhi Daredevils on 19th May. There were a lot of preparations done before the day ranging from getting the exact number of people visiting to the transportation. Routes were earmarked. Vehicles were assigned and route coordinators chosen who would take care of the team members going from their route. Finally the day came. We got our tickets in the morning. We learnt that we had got corporate passes. So we would be sitting in the corporate stand. Finally we left our office at about 5:45 pm. Heavy traffic in Bangalore (as usual) meant we reached at about 7:10 pm. In the meantime, it had began to rain and drench our expectations. Weather in Bangalore is unpredictable and so we all started praying that by the time the match started, the skies would clear up. I think the weather gods heard our prayers because the rain stopped just when we reached the stadium. As we took our seats in the stands, one couldn't help but praise the ground. Amazing! The ground was right in front of us as we were in the lower row. And the entire view was simply breathtaking. Shaan had just finished his performance (which meant we had missed a great show) and got the crowd buzzing. As the captains of the 2 teams (Dravid of RCB and Sehwag of DD) came out into the ground along with the cheerleaders, the crowd started shouting. We were divided over where to keep our focus on. Sehwag then won the toss and chose to field first. So RCB were to bat first. We got our drinks (which were complimentary) and waited in anticipation. Unlike the earlier tournaments, when one had to wait for the teams to come out for the entertainment to start, the IPL didn't keep anyone waiting. The cheerleaders had started their job. One song after the other, and one move after the other, they managed to make the crowd dance very well to their tunes. The ground had 3 symmetrically placed stands for the cheerleaders and fortunately, one of them was just on front of us. Now having a group of about 100 members, with minimum 20 of your peer age has its benefits. You can have amazing fun without worrying if anyone would feel bad about it. We had lots of placards put up. From 'Mallaya Adopt Us!' to 'Cheer gals V Luv U! ', we had various kinds of placards. People put up their cell numbers asking the cheerleaders to call them. I have no idea how much of their effort suceeded. But one thing was sure, the amount of shouting we did managed to attract the attention of the dancers and they actually waved back. Awesome fun! Meanwhile, the match was in progress. Bangalore were struggling (as usual) but their debut batsman - Srivatsa Goswami wasn't. He was hitting fours and sixes all over and managed to take the game to the Delhi bowlers who were on fire. McGrath was bowling with an impeccable line and Maharoof was chipping in with some good bowling. On the other hand, Goswami was losing partners as most RCB batsmen were losing wickets. But Misbah managed to hit some sixes towards the end to bring up the Royal Challengers to some respectable total. The break meant some more show by the cheerleaders. And when the second innings started, Bangalore was bowling. So they were dancing at the fall of the wickets and in between overs. There were a lot of people clicking their camera phones. Nobody wanted to miss the fun. But the nature of the crowd, coupled with the moves of the dancers made it very difficult to get blur-free images. Anyways, I managed to get some decent clicks of one of their moves. Moving on to the game, for Delhi, Sehwag and Gambhir, the highest scorers in the competition, came out to bat. And as predicted, they started hitting the Bangalore bowlers. After Sehwag scored a typical quick fire 47, Praveen Kumar got him caught by Chipli. Then De Villers came in and steadied the innings with a patient 21. Meanwhile, our ABG team was going crazy. As most of them were Delhi supporters (which was actually not surprising), they were cheering each hit by Delhi. Finally, with some hitting by Dhawan and Maharoof, Delhi managed to end the match. In fact, Dhawan ended the match with a six. Bangalore team had lost another match but our ABG team had not. It was a thoroughly delightful experience for all of us. Hopefully, we will have more such fun with this team in the future. You must be thinking what this is, isnt it? But seriously, this was the best eye-catching topic name that I could come up with for an article on the most mudslinging, bitching, politics-filled show on Indian television right now - Roadies 5.0. The show is filled up with more instances of slang use than other things. Its difficult to hear even a single line said by the contestants without this sound. And in 90%+ cases, its done to mask the F-word. From reactionary comments to bitching, the contestants use it as if they got truckloads of it and want to dispose them off. I understand that in the current Indian society, it sounds cool to use this language. And probably its our generation getting personified screen there. But seriously, it seems that this current edition of Roadies has taken bitching, politics etc to a whole new level all-together. The show had started out promoting itself as the place to find the toughest roadie. In the auditions too, what was tested mostly was the strength of the contestants in handling situations and confidence in performing tasks. However, tasks are the least interesting events on the show now. In fact, the current group is performing so badly, they have already been branded a group of non-performers. The best performer by far was Vikrant. But he was voted out due to some expert strategy by Snehashish and Nihal. And then, very cleverly Snehashish was voted out. Shambhavi has been getting lucky a lot of times. She got the advantage once and then the roulette thing. She will go a long way because of this. It was precisely because of bad luck that Ankita is out. And in the last vote out when Ashutosh gave the immunity to the group of Shambhavi, Anmol and Aayaz saying that Aayaz was the closest to getting the immunity, so he deserves it; it was fully clear that they had planned to vote out Prabhjot from the show. Vote-outs have indeed become the most interesting part of Roadies. Coming back to the tasks; be it money task, or immunity or advantage; this batch of Roadies have been doing very poorly. They fared miserably in the ball-out immunity task with none of them hitting the stumps. In fact, at some point they started indulging in sledging and commenting about one-another's looks rather than concentrating on the task. And be it the tennis task in Bangalore or the banana task in Goa, they have been pathetic. Most of the points scored during the tennis task were from double faults or mistakes by the trained players. And yet they seemed too happy. But come to using foul language, and they are champs there. The show is indeed getting away from the bracket it was earlier in. I used to watch the earlier Roadies to see people who had guts to complete tasks. But now, I mostly watch it for the vote-outs, masala and stuff. And most of the viewers will agree with me that this has become the thing to WATCH OUT FOR in this current edition. The auditions were far better and much more interesting. I just hope that Raghu can make it interesting in the International leg. Otherwise a good show will become just some other late night show. Finally! Finally after three lost chances in 1986, 1992 and 2004 when they didn't even win a single match in the best-of-three finals Down Under, India has managed to upstage the Aussies. It finally ended one of the most turbulent tours for India, a tour which was at a point in danger of ending prematurely. The racism row involving Bhajji and Symonds; the on-field bickering; all seem to have been forgotten in this wonderful victory of India. The impact, importance and extent of the victory for India could be easily seen from the wild celebrations at the Gabba that were triggered by the fall of the wicket of James Hopes. The wicket of Hopes finally ending any hopes of Australia of snatching the match from India and keeping the series lively. But unlike previous times, this victory was not fashioned solely by the so-called seniors in the team. In fact the lion share of the victory goes to the 'Young Brigade' of India. It was Praveen Kumar who started the Aussie downfall with the highly prized wickets of Gilchrist(1st over) and Ponting(3rd over). And then later when the Hayden-Symonds partnership was beginning to threaten India, a single over of Bhajji turned around the match in favour of India. Hayden was run-out and Symonds was out lbw. It turned out to be the most important over of the match. Before that it was Tendulkar who played the anchor role again to steer India to a competitive score. He was unlucky not to score a second succesive century missing it by a mere 9 runs. Uthappa, Yuvi and Dhoni chipped in with important and quickfire contributions. India missed a golden chance to score big in the final overs when they lost their way somewhat in the overs 40-45. But then, All's well that end's well. India have won the series 2-0, and that's what matters. Coupled with the colts victory of the U-19 WC at Malaysia, and it already looks like the next generation of Indian cricketers has arrived and they have that hunger for victory which we so badly missed earlier. The entire nation is celebrating this superb time for Indian cricket, and so am I. When Dhoni's boys had won the T-20 WC I had jumped on the floor and danced on the streets with my roommates and others in the locality. That's because there is nothing more binding for the people of India than cricket. Now when the boys look to have turned to be men, showing the character and will-power to upstage the Aussies at their own den, I bet that each and every Indian has a smile on his face. Finally I would like to sign off with statement. When Ponting had said before the start of the Best-of-three finals in the Commonwealth Bank series that the third final would not be required, I bet he wasn't expecting this result. Cheers!